ENGINEERED TO DELIVER THE MOST INCREDIBLE POWEREVGA SuperNOVA power supplies have won over 70 awards over the last 3 years for their supreme PSU units, which provide remarkable proficiency, performance and durability. The G3 Series have adapted previous features from the EVGA G2 Series to create an even greater source of power. This incredibly advanced PSU, although smaller in size delivers a whisper-quiet performance with an all new Hydraulic Dynamic Bearing fan. Made with heavy-duty protection features and high quality Japanese brand capacitors all with an EVGA amazing 7-year warranty. 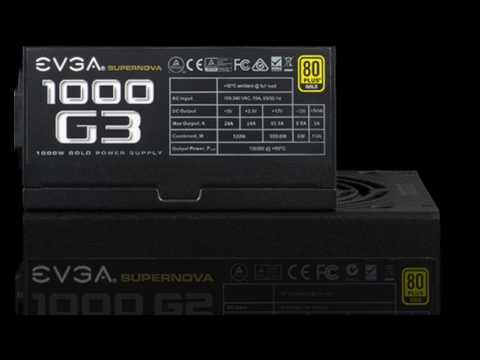 WITH NVIDIA SLI & AMD CROSSFIRE CAPABILITIES At only 150mm long, the EVGA SuperNOVA G3 is one of the smallest power supplies on the market, although small in size this PSU still offers the greatest performance while delivering the power that PC enthusiasts need. This compact PSU features NVIDIA SLI and AMD Crossfire capabilities and heavy-duty protection that will always keep you at the top of your game. FULLY MODULAR DESIGN With the G3 Series PSUs you’ll only have to use the cables you need, allowing you to improve your airflow and reduce cable clutter inside your PC. SMART FAN AND THERMAL CONTROL The SuperNOVA G3 hosts a remarkable Hydraulic Dynamic Bearing Fan that delivers super-quiet operation and helps increase the lifespan of your rig. Alongside this, EVGAs EGO Intelligent Thermal Control System works to eliminate fan noise at low to medium task loads to give you near-silent operation. PROTECTED FOR YEARS TO COME The EVGA SuperNOVA G3 650 Watt is 80 PLUS Gold certified and is backed by a generous 7-year warranty, assuring you that you’re using great, reliable power and are protected for years to come. 650W EVGA G3, 80PLUS Gold, Full Modular, SLI/CrossFire, Single Rail, 54.1A +12V, 1x130mm Fan, PSU is rated 5.0 out of 5 by 4. Rated 5 out of 5 by Allan54 from Does exactly what I want. I reviewed several power supplies before I settled for this one and I am very happy with it.Its not the cheapest but I think the quality makes up for this. Rated 5 out of 5 by 604ANT from 650W EVGA G3, 80PLUS Gold This PSU is perfect for my Overclocked RYZEN 2600X and NVIDIA GTX1070. I would recommend it. Rated 5 out of 5 by plexike from Changed my Corsair RM550 Quiet, i think 650Watt more than enough for an i5 and one Radeon in a miniITX conf. Cables are okay.